Western blot analysis of extracts from various cell types using ACSL1 Antibody. 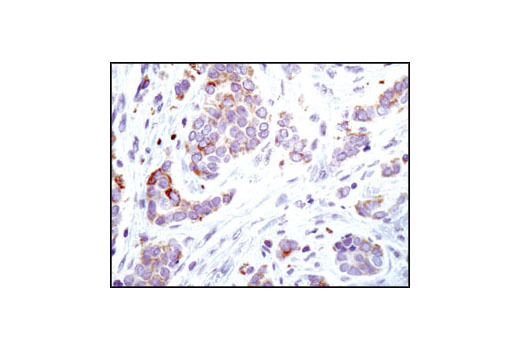 Immunohistochemical analysis of paraffin-embedded human breast carcinoma using ACSL1 Antibody. 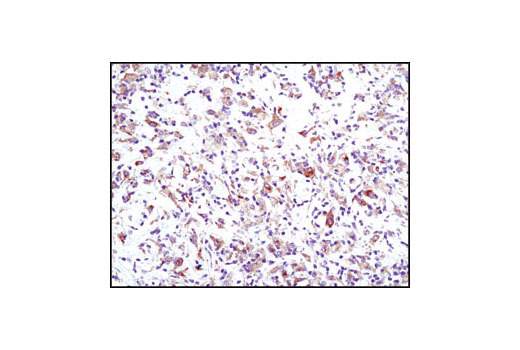 Immunohistochemical analysis of paraffin-embedded human lung carcinoma using ACSL1 Antibody. 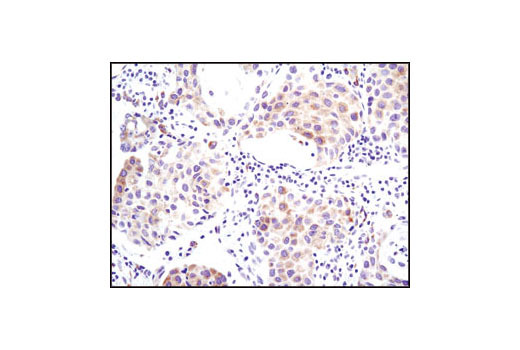 Immunohistochemical analysis of paraffin-embedded human lymphoma using ACSL1 Antibody. Remove blocking solution and add 100-400 µl primary antibody diluted in SignalStain® Antibody Diluent (#8112) to each section. Incubate overnight at 4°C. Remove primary antibody and wash section three times with wash buffer for 5 minutes each. Cover sections with 100-400 µl pre-mixed ABC solution as needed and incubate in a humidified chamber for 30 min at room temperature. 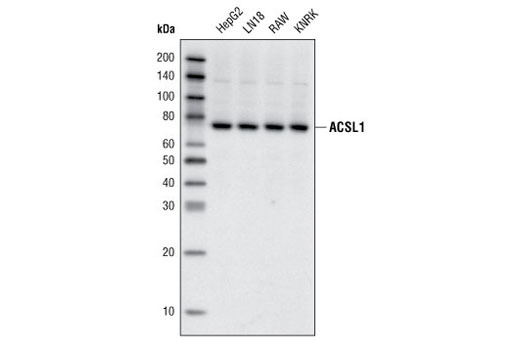 ACSL1 Antibody detects endogenous levels of total ACSL1 protein. Polyclonal antibodies are produced by immunizing animals with a synthetic peptide corresponding to a sequence of human ACSL1. Antibodies are purified by peptide affinity chromatography. Mammalian long-chain acyl-CoA synthetase (ACSL) catalyzes the ligation of the fatty acid to CoA to form fatty acyl-CoA in a two-step reaction (1). Five isoforms of ACSL have been identified (1). These isoforms have different substrate preferences and subcellular localizations (1). Overexpression of ACSL1 results in changes to fatty acid metabolism in rat primary hepatocytes (2). Mashek, D.G. et al. (2004) J Lipid Res 45, 1958-61. Li, L.O. et al. (2006) J Biol Chem 281, 37246-55. Li, L.O. et al. (2009) J Biol Chem , .